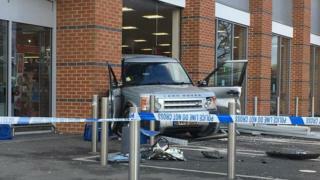 A stolen Land Rover was wedged in the side of an Aldi store in Oxford after being reversed into it by burglars. The offenders used equipment attached to the vehicle to try to steal a cash machine from the store at Horspath Driftway late on Saturday. However, their attempts failed and they fled on foot empty-handed. No-one was injured in the incident. Thames Valley Police is appealing for witnesses and is investigating whether it is linked to other burglaries. One woman, who did not want to be named, saw the wrecked aftermath on Sunday morning, and said it was "shocking to see". She added: "At first we thought it might just be someone who had parked really badly. But then we wondered if it was a ram-raid."